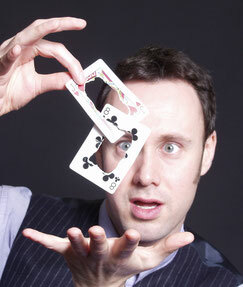 Comedy Magician Sean Carpenter is widely regarded as one of the UK's most entertaining stage magicians. Sean's warm and playful style of comedy, combined with amazing feats of magic and mind-reading, make him the perfect cabaret entertainer for any event. See the video above for a sneak preview, or visit the STAGE MAGICIAN for Hire page for more information about the comedy stage magic of Sean Carpenter. Winner of the British Close-Up Magic Championships. Table Magician Sean Carpenter is one of only three magicians in the world to have won both the British Close-Up Magic Championships and the Close-Up Magician of the Year award from the International Brotherhood of Magicians. To guarantee the success of your event, you need a professional entertainer you can rely on. Sean Carpenter is professional table magician with over 20 years experience as a close-up entertainer. From The Orient Express to the world’s most exclusive hotels, and from luxury cruise liners to the staff party at a meat pie factory in Leicester - Sean Carpenter has amazed and entertained audiences all over the world! With a contagious sense of fun, and two of the most skilful hands in the business, Sean Carpenter is one of the UK's most experienced professional close-up magicians - and the perfect entertainer to guarantee the success of your next event. Sean is also an experienced promotional magician, entertaining at car launches and promotional events all across the UK. Visit the TABLE MAGICIAN for Hire page to discover how the amazing close-up magic of Sean Carpenter can ensure your wedding, banquet, promotional event or awards dinner is remembered for years to come. You can also read many quotes from previous clients on the TABLE MAGICIAN and WEDDING MAGICIAN pages.